There are several convenient ways to order Eco-Products. Typical US orders ship within 2 business days of processing. 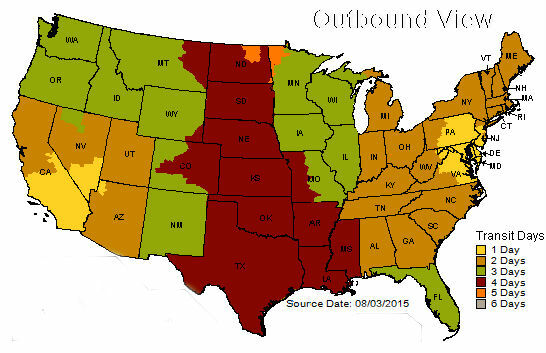 The map below gives you an estimate of shipping time across the country. In the event that an item on your order is out-of-stock, we will notify you seeking permission to process the remaining items on your order without the affected item. Your order will be on hold and will not ship until we hear back from you. The out of stock item will not be placed on backorder and will need to be reordered once the item is made available via our website. Orders exceeding 25 cases or more may be shipped via common carrier. We only ship via FedEx Ground within the continental US. Only in rare cases are personal FedEx account number permitted for use. Please note that additional shipping fees may apply for products shipped from warehouses in USA when when personal account numbers are used. United States: Shipping is free on orders over $99.00. Free shipping applies to FedEx ground only and excludes AK,HI; expedited orders do not qualify for free shipping. You will receive a shipping Tracking number via email on the day your package ships, within 1-2 business days of your order.